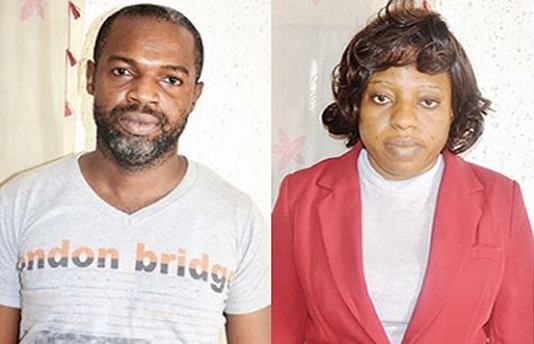 The National Drug Law Enforcement Agency (NDLEA) arrested 37-year-old Uju Gloria Ezeabata pictured left, with 1.325kg of methamphetamine at the Murtala Muhammed International Airport (MMIA) in Ikeja, Lagos. According to a report by The Nation, investigations by the anti-drug agency showed that Uju, who was recruited on facebook, was taking the drug to Malaysia. The cartel’s suspected leader, Philip Maduabuchi Akpaka, 39, was also arrested. NDLEA Lagos Airport Commander Ahmadu Garba while commenting on her arrest, said “Gloria was arrested during screening of passengers on an Ethiopian airline flight on her way to Malaysia at the departure hall. Substances that tested positive for methamphetamine weighing 1.325kg were detected in her luggage. The drug was concealed in 26 packs of Indomie noodles in a bag of foodstuff containing plantain, pepper, melon and other spices. Further investigation led to the arrest of Akpaka, who allegedly coordinated the travel arrangement for Gloria and gave her the bag containing the drugs”. Also commenting on the arrest, NDLEA Chairman/Chief Executive Roli Bode-George urged the public to be wary of drug cartels. The cartel’s suspected leader Akpaka admitted preparing Uju’s travel papers at the instance of his Malaysia-based friend. “I am a transporter. My friend in Malaysia asked me to prepare travel documents for Ezeabata. He also asked me to give her a bag to take to Malaysia,” he said.